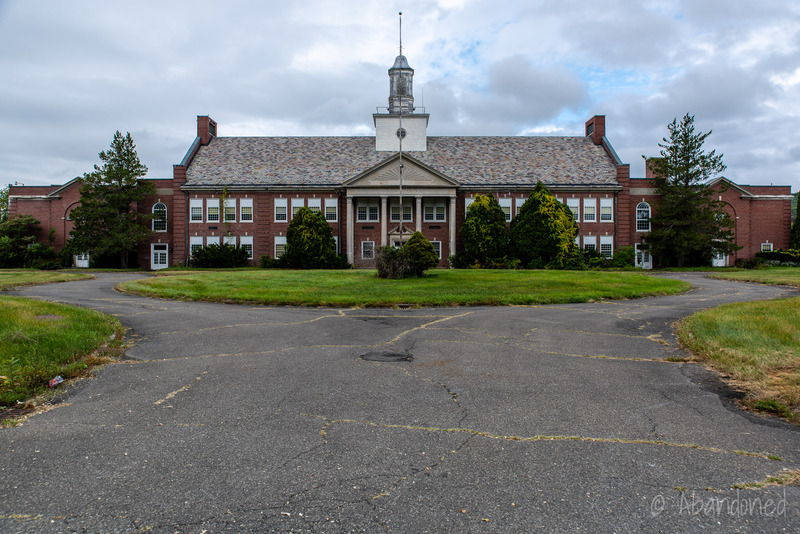 The Taconic Central School, once considered the largest school district in the state, is an abandoned circa 1931 school in New York. The initial name, “Roeliff Jansen,” was chosen after a well-known Dutch settler, Roelof Jansen, who resided in the area in the 1630’s. 2 It later became just Taconic. 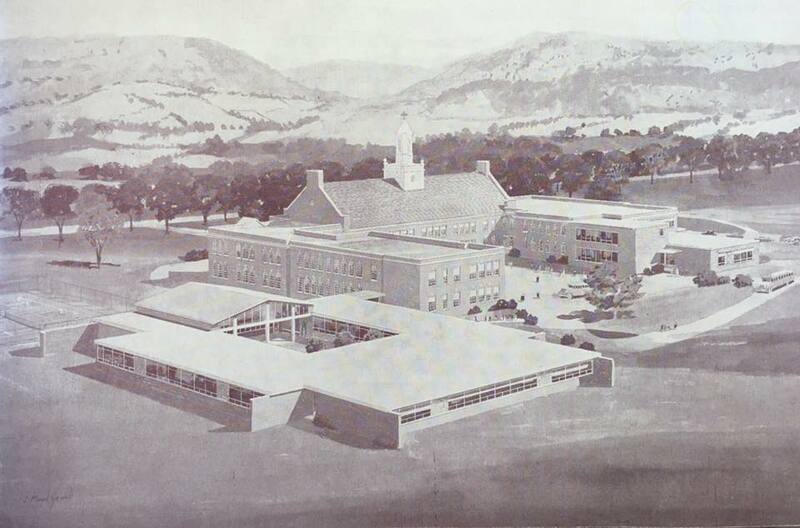 By 1950, the school designed for 600 students was bursting at the seams with 900 students. 6 The cafeteria, designed to feed all students in one sitting, operated on four shifts. 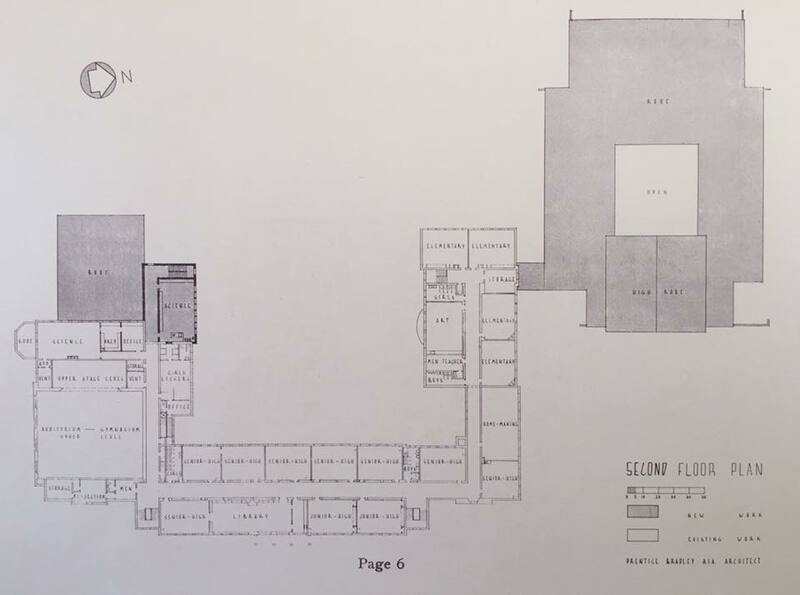 In addition, space designed for closets and supply rooms were used as classrooms. In 1957, Taconic wanted to celebrate its 25th anniversary and reached out to the public for ideas. 2 Eleanor Grover offered to donate a large, antique, bronze bell that had been hung in a rented barn for years. Grover suggested that the bell is raised in a traditional bell raising ceremony and be rung once every ten years in commemoration of the school’s construction. With a unanimous vote by the school’s board, Grover’s donation of the bell was secured. The school’s maintenance crew and volunteers of the Hillsdale fire company used a crane to hoist the bell atop the cupola in the front of the building on September 13. 2 Secured in place, the school principal rung the bell at 3:00 PM. An addition on the north side of the school building was constructed in 1951-52. 3 5 Designed by Starlett and Van Vleck, Reginald E. Marsh and Howard C. Snyder and constructed by George E. Emerson, it resembled the circa 1931 building but with less detail. Overview of the 1962 additions. Overview of the 1962 additions shaded in gray. The addition was named after John D. Ackley, Fred A. Glynn and J. Sterling Wyckoff who had devoted a combined 75 years of service to the school. 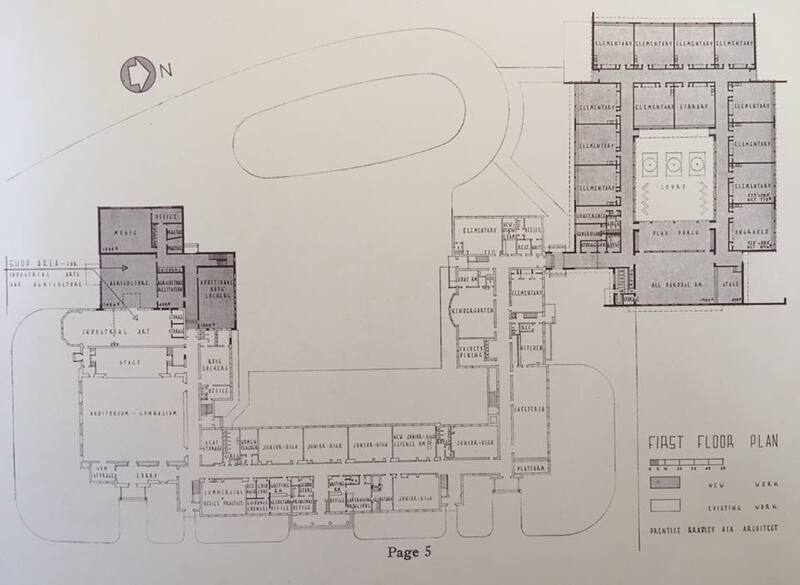 Designed by Prentice Bradley and constructed by C. H. Nickerson & Company, the new construction featured a new cafeteria and stage, restrooms and classrooms. An addition to the south side containing lockers for the gymnasium and technical education facilities was also added in 1962. The Taconic Hills Central School for K-12 students opened in September 1999 at a cost of $50 million. 1 Designed by Rhinebeck Architecture & Planning of Rhinebeck, the 350,000 square-foot complex was designed for a capacity of 2,000 students. The facility groups K-2 and 3-6 grades in one wing with 7-8 and 9-12 in a separate wing with a community centre. The new building also includes a 1,000-seat performing arts centre, two media centres, an aquatic and fitness centre, and three gymnasiums. † The actual name of the location has been modified to protect the location as much as possible from vandalism. Karen. “About Taconic Hills Central School District’s Campus.” Farming Our Future, Oct. 2011. Article. Moore, Ted. “The Hell Bell Becomes a School Bell.” Curse of the Bell, Bloomington, AuthorHouse, 2005, pp. 78-81. “The Central Rural School and Community Organization.” Bulletin, 1938, pp. 698-721. “940 Enroll at Roeliff Jansen.” Poughkeepsie Journal, 19 Sept. 1951, p. 10. “Roeliff-Jansen Overcrowding Laid Before PTA at Hillsdale.” Berkshire Eagle [Pittsfield], 27 Sept. 1950, p. 22. This is in error. This is not Taconic Central School.It is [redacted] Central School. The [redacted] school district merged with the Ockawamic School district to form the Taconic HillsCentral School District. The new school disrict built a new facilty, which is Taconic Hiills Central School, a totally separate facility in a totally separate location. This is, was, and always will be [redacted] Central School. I have modified the name of the school to protect it as much as possible from vandalism. The community had a chance to have the building & grounds operationable but shot down the opportunity shortly after it closed. So the “towns bigshots” bought it to shut that opportunity down . No look at it , it was a beautiful building. I have a non profit for battered women and children and would love to turn this into tansitional housing as there is a huge need in the area. I went to this school and it’s vacant and unsecured and deteriorating by the day. Found this on you tube. Here is proof of a break in at this place. Such a shame that it sits empty. Such a beautiful old building. The [redacted] was built in 1931. The addition was added in 1962. Taconic Hills incorporated 10 towns when the two schools, Roeliff Jansen and Ockawamick, merged in 1969. That is when it was named Taconic Hills Central School. Taconic Hills brand new campus opened in 1999. The name of the school is deliberately misleading as the property is still pristine and mostly vandalized. Hi. Sherman I’m not sure I understand what you mean by ‘mostly vandalized’. I would hope that it wasn’t. Thanks for the photos. I wish there were more! I grew up in that building. When I dream of school it’s of that beautiful place. I’m not one for nastagia but there is something special about that place. Even abandoned it’s still so beautiful. I can still remember walking up and down the worn down stair cases.